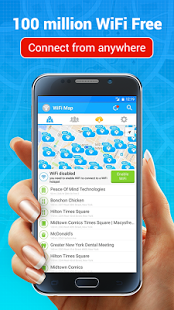 WiFi Map Pro Access fast internet for Free with access to wifi networks! Download Wifi Map! WiFi Map Pro is an app created by WiFi Map LLC (whose official website is http://www.wifimap.io/). WiFi Map Pro has a rating of 4.3 on the Play Store, with 332652 votes. Similar apps are: WIFI PASSWORD (by Free Wifi password projects), Japan Wi-Fi (by NTT Broadband Platform Inc.), FastConnect (by The Cloud Networks), WiFi Chùa (by WiFi Chùa Pte Ltd (WiFiChua.co)), Wiman Free WiFi (by Wiman), Wi-Fi Map (by WADAMARKET VIETNAM LTD. CO.), Wiffinity - WiFi Access Password (by WIFFINITY), Free WiFi Internet Finder (by kapron-ap), MAPS.ME Lite (by My.com B.V.), Google Maps (by Google Inc.). WiFi Map Pro is currently available in the following countries: Peru, Switzerland, Romania, Israel, Turkey, Thailand, Germany, Japan, Denmark, Slovakia, Netherlands, Greece, Ukraine, United Arab Emirates, Poland, Estonia, Chile, Australia, Austria, Singapore, Indonesia, Czech Republic, South Korea, Colombia, Croatia, United Kingdom, France, Serbia, Sweden, Latvia, Lithuania, Norway, Finland, Hungary, Belgium, Hong Kong, Spain, Taiwan, Philippines, Russia, Malaysia, Bulgaria, India, Canada, Mexico, South Africa, Italy, Brazil, Portugal, Argentina, Saudi Arabia, New Zealand, United States, Egypt, Vietnam. - Test your Download, Upload and Ping! - Monitor all devices connected to your WiFi hotspot. You can evaluate security levels, detect intruders and resolve network issues. - Added an option to remove advertising forever! Finally! OpenVPN Connect is the official Android VPN client for OpenVPN servers. Show Wifi Password 2016 is an app that shows the passwords for wifi connections. "Search" for and "Connect" to Free Wi-Fi in Japan!